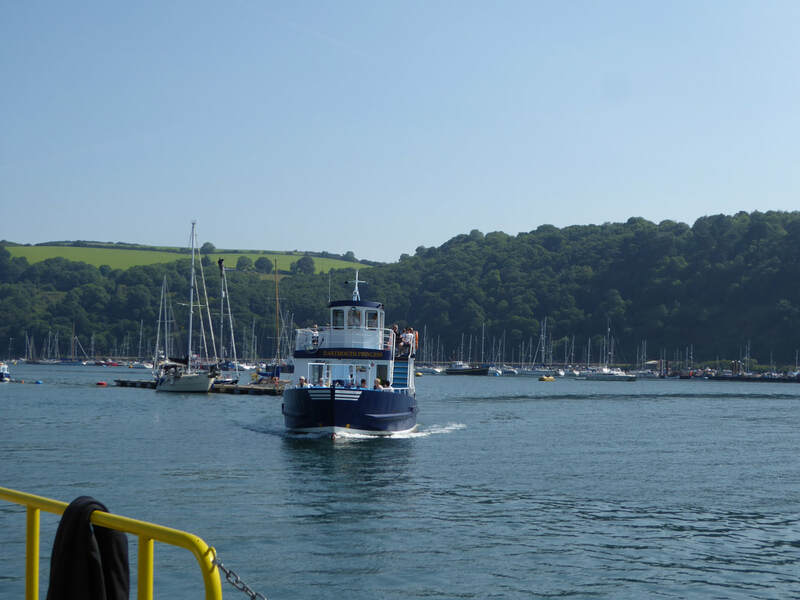 After a super Breakfast with Colin we wished him well and made our way down to the Ferry which would take us over to Kingswear. 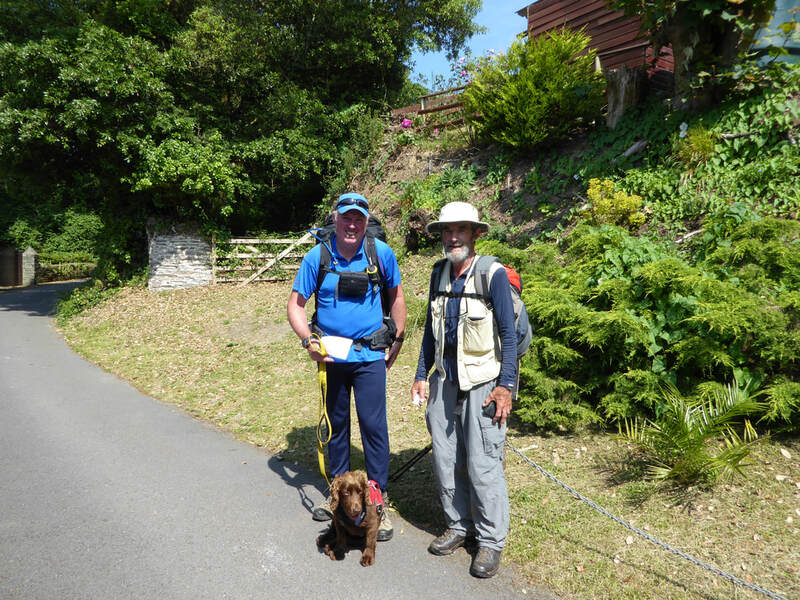 Shortly after leaving the jetty we bumped into a chap called David Hatto, a 74 year old Canadian walking in aid of his Granddaughter's Charity - we walked with David for a while but would see him off and on over the next week or so. 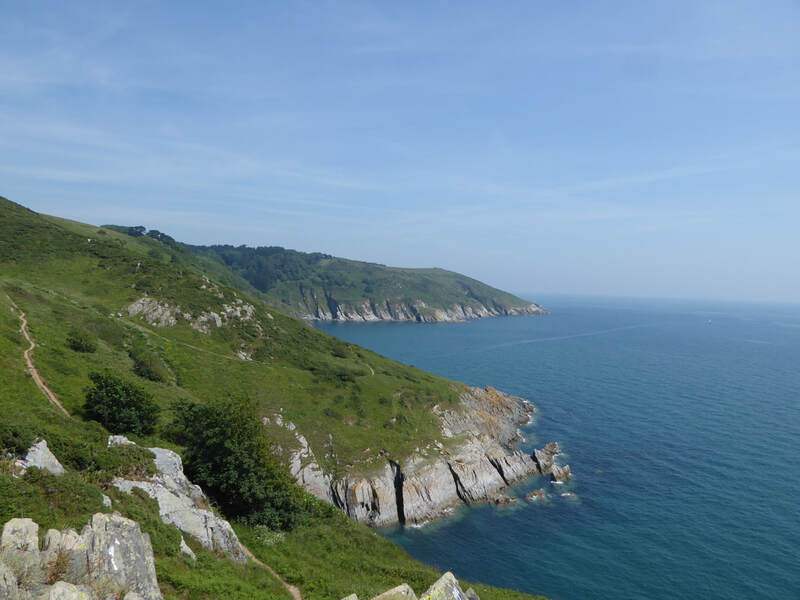 We knew that Kingswear was the childhood home of Lieutenant Colonel H Jones who died bravely in the Falklands Conflict of 1982 - a plaque commemorating this is sited near the path and part of this section is dedicated in his memory. 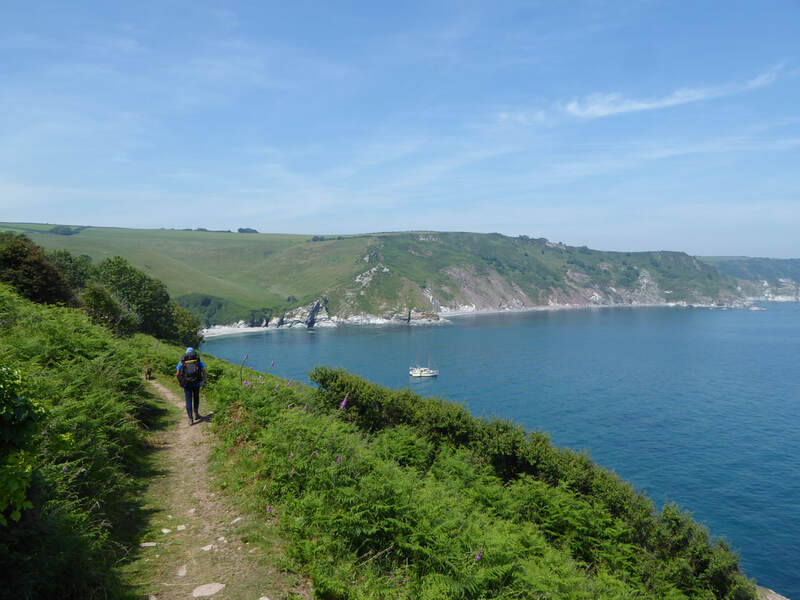 The walking day began with a wake up call for the legs - after a rest day it takes a while for them to get moving and they were tested thoroughly climbing out of Warren Wood. It was already extremely hot and again hydration was clearly in our minds all day - warm temperatures bring discomfort as well as pleasure for the long distance walker! 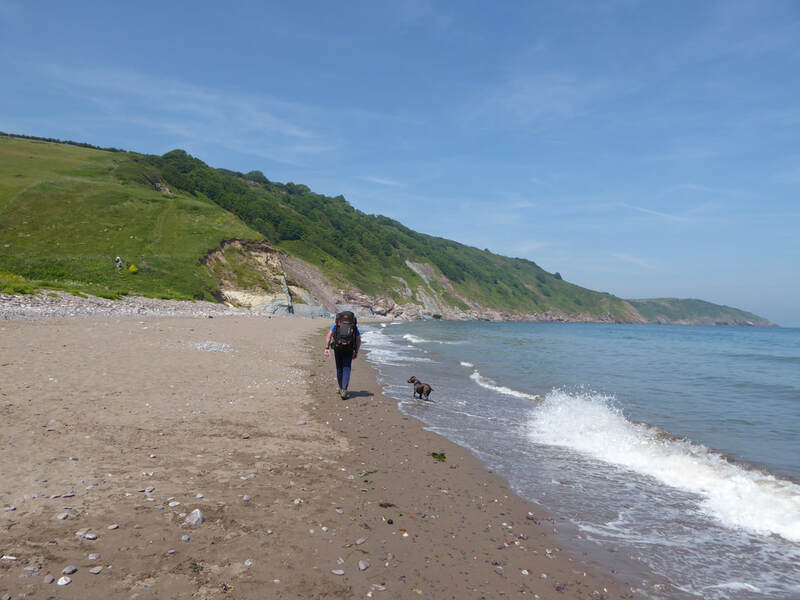 We already knew that a couple of Facebook friends would be on the path today and it was near Froward Cove that we met the first of them - Kaz Farndon who we chatted with for a while and who very kindly gave us a donation to Fudge's Charity. 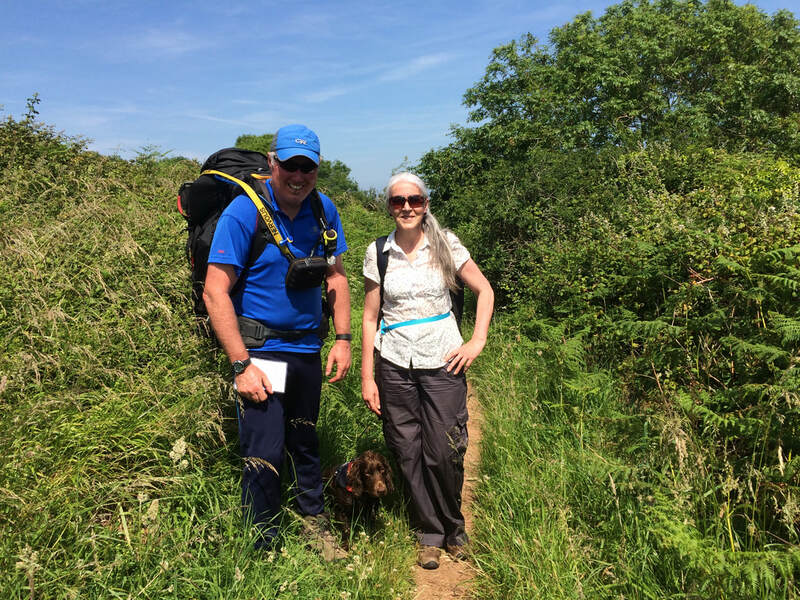 Shortly after meeting Kaz we passed a bloke who instead of a cheery "Good Morning" commented in a gruff voice "I bet those rucksacks are heavy" - clearly he had a Masters Degree in "Stating the bleedin' obvious". 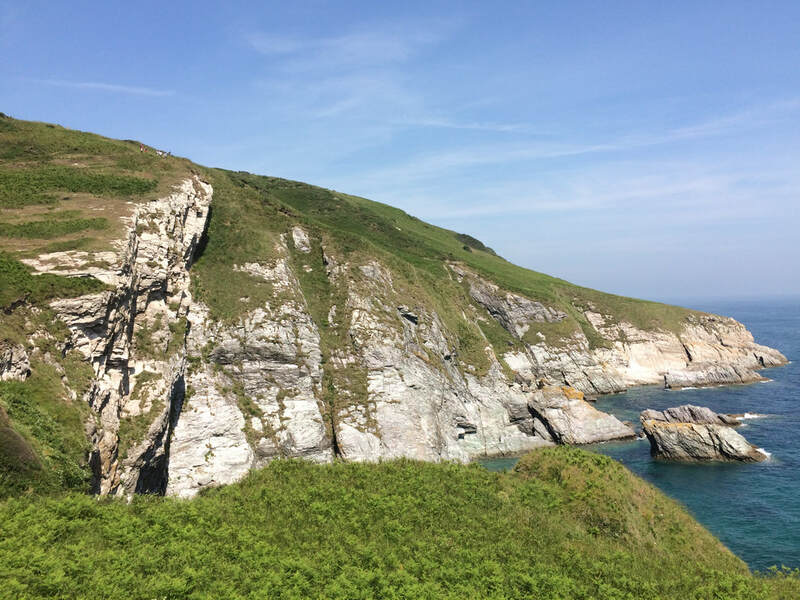 We continued on - lots of undulations today which were difficult in the heat but thankfully we had a fair bit of shade. 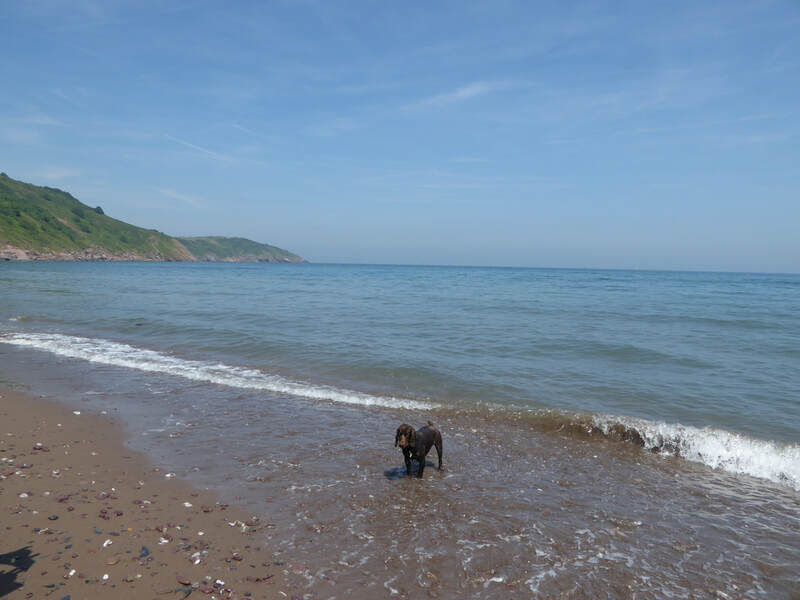 Absolute bliss at Man Sands for Fudge as he dived into the sea to cool off - this really was a lovely spot and we had it to ourselves today. 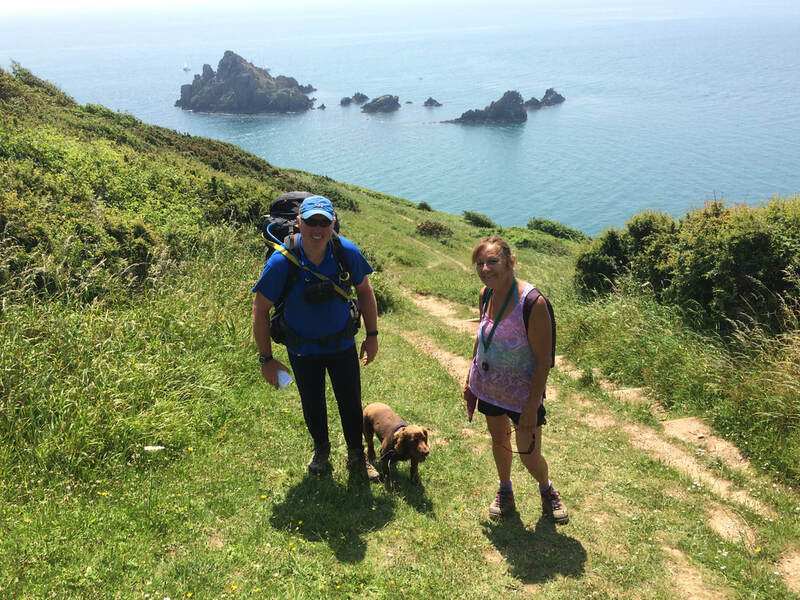 We were now keeping an eye out for Lucy who runs the SWCP Facebook Group - and near Southdown Cliff we met her and stopped for a brief chat. 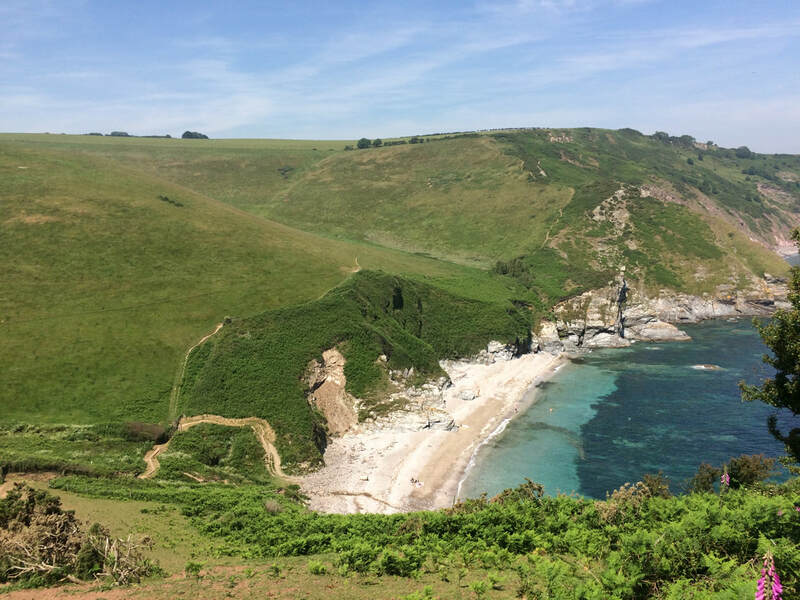 For anyone planning to walk the SWCP in any format then it is well worth joining the group - it is a superb resource of advice and knowledge. 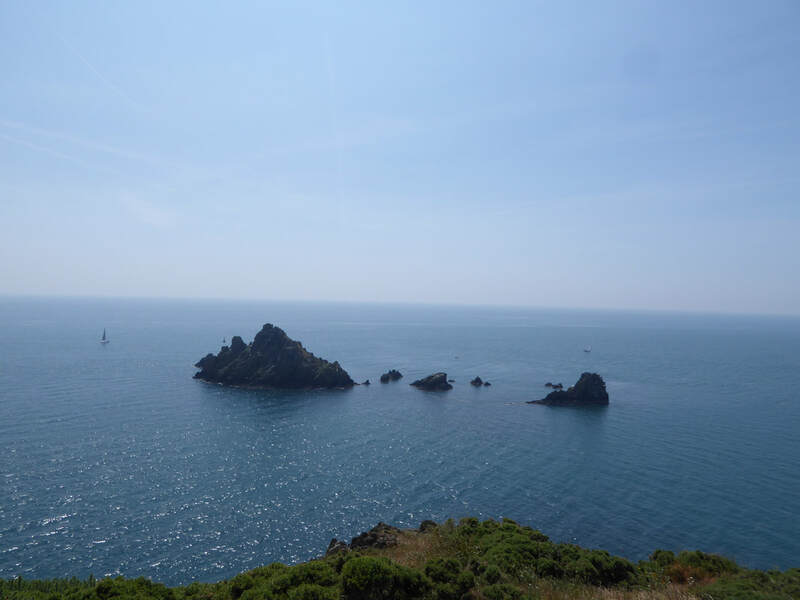 ​Brixham seemed to take an age to get to and just before Berry Head we bumped into a foursome of walkers who were eating Ice Creams - they very kindly informed us where the shop was therefore Angie went off in search of various cold dairy products and cold drinks. 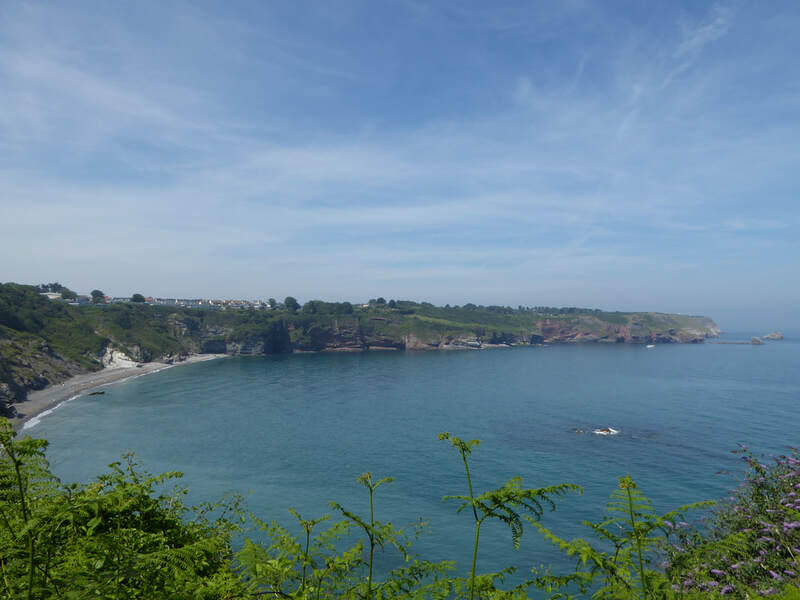 We eventually reached Brixham and wandered around the very busy harbour before catching the 1735 ferry to Torquay where we were staying for 2 days - a 25 minute ferry journey for £2 each - what a bargain!! 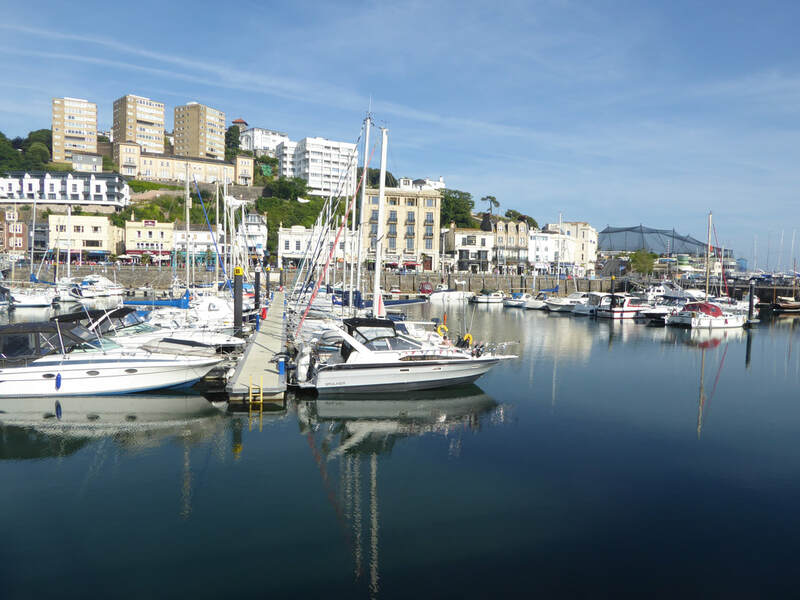 In Torquay we decided to have supper before checking into the B&B and as it was a very pleasant and warm evening we sat outside The Offshore in the harbour and enjoyed a lovely meal. 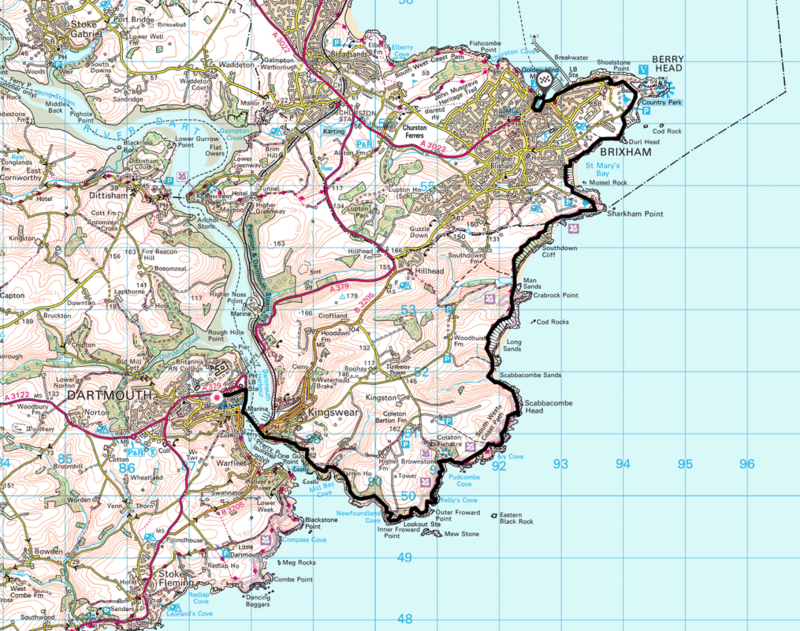 It was here that tragedy struck again - Angie's £1.99 "Padstow Specials" sunglasses snapped in half - they did last a good few weeks though. 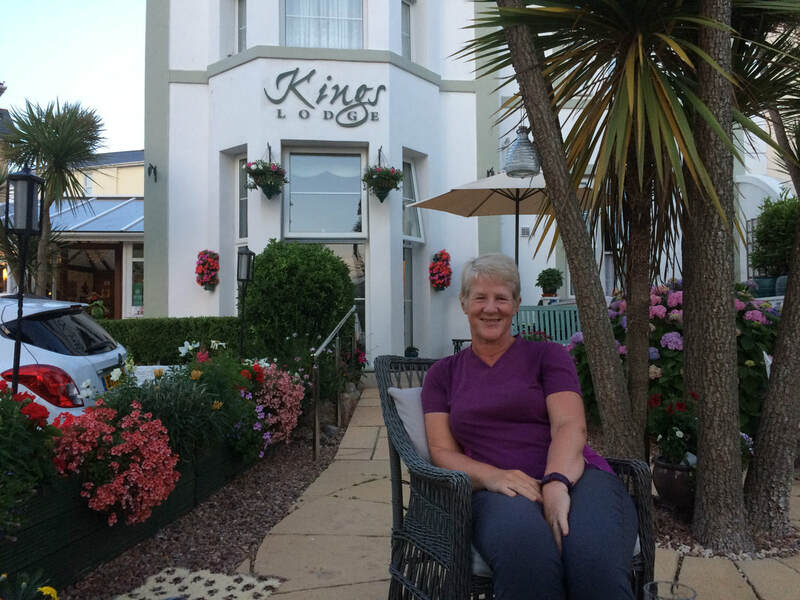 ​All that was left to do was to find the B&B in the depths of Torquay - it was a mile or so walk up to King's Lodge where on arrival we received a very warm welcome. The added bonus was that they were licensed therefore after a shower and sort out we sat on the Terrace testing out their ice cold Lager in company with some fellow guests - 3 lovely ladies from Essex. 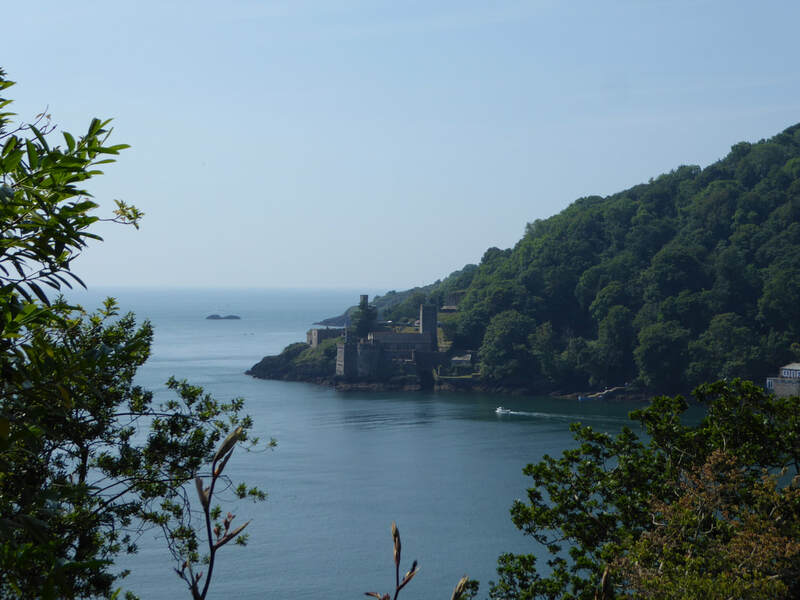 The building resembling a castle at Mill Bay Cove. 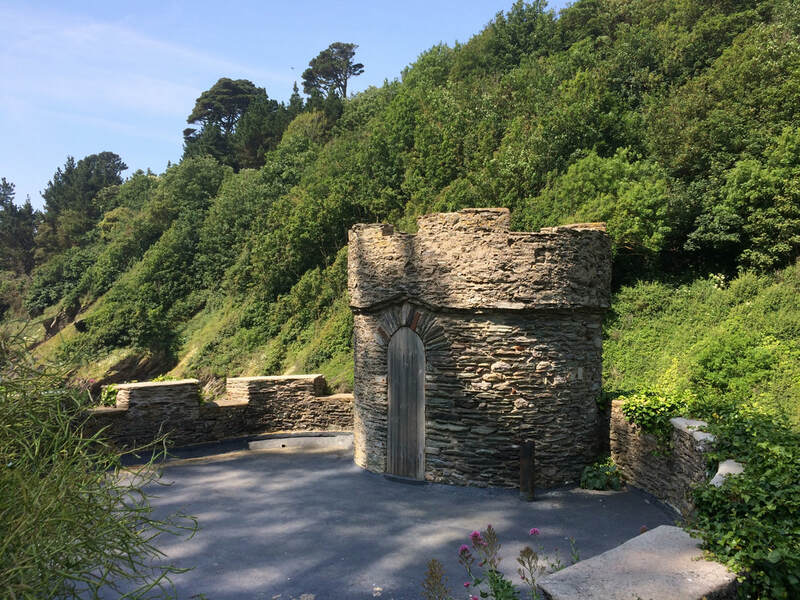 It is in fact a lime kiln and was built early in the 19th century to burn limestone for making fertiliser. 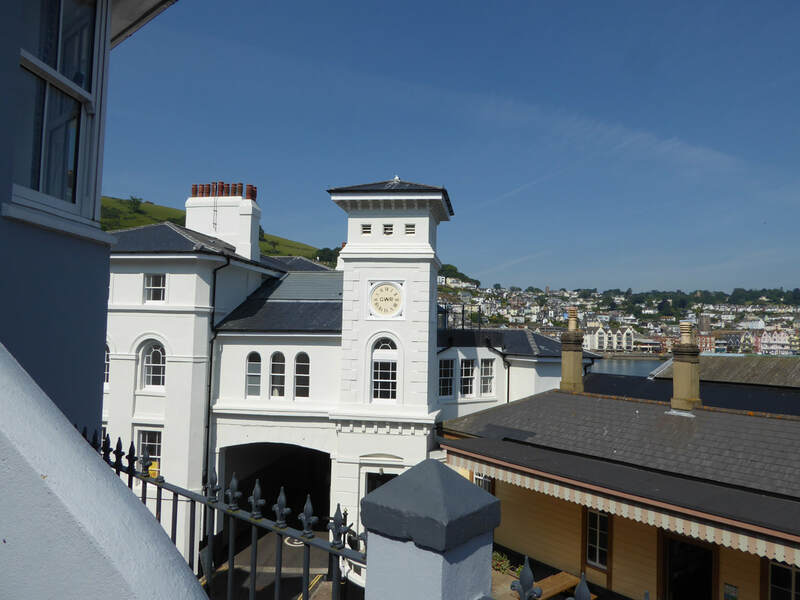 The parapet and turret were added later with battlements and the Gothic pointed-arch doorway. The kiln was later converted into a boathouse and watermill. 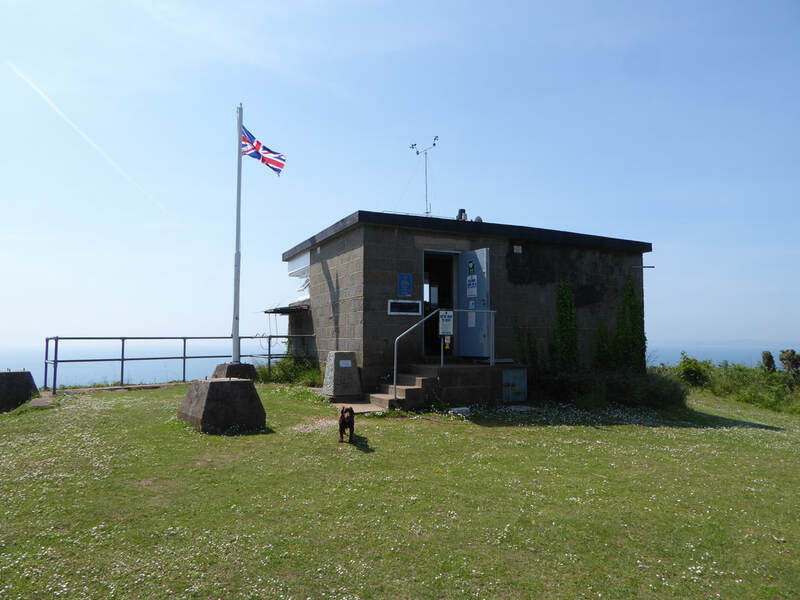 The National Coastwatch Institution Lookout Station at Froward Point. 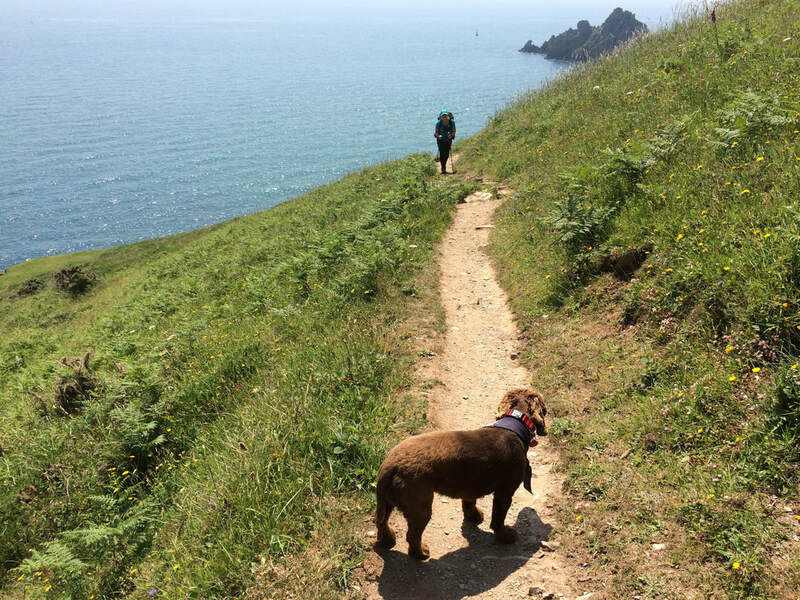 ​Fudge had just been in to cheer them up and to see if they had any biscuits. 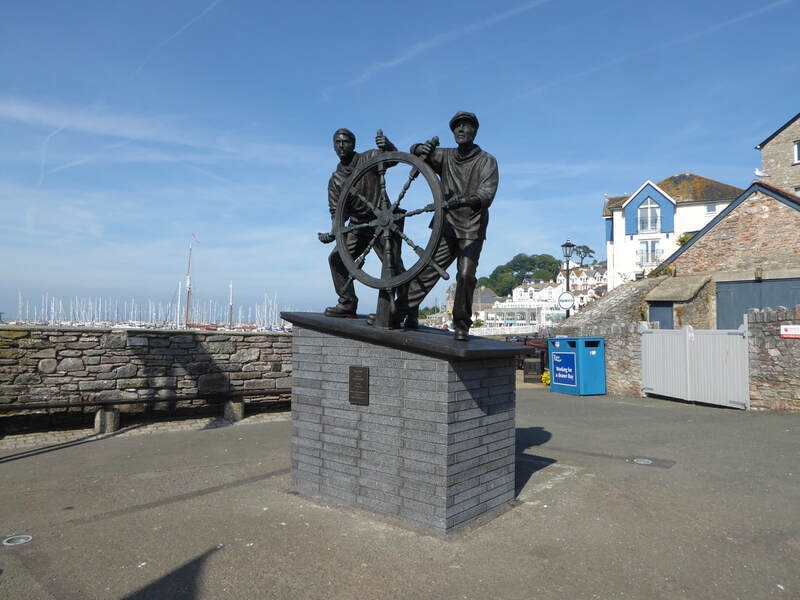 The statue "Man & Boy" in Brixham Harbour on King's Quay. 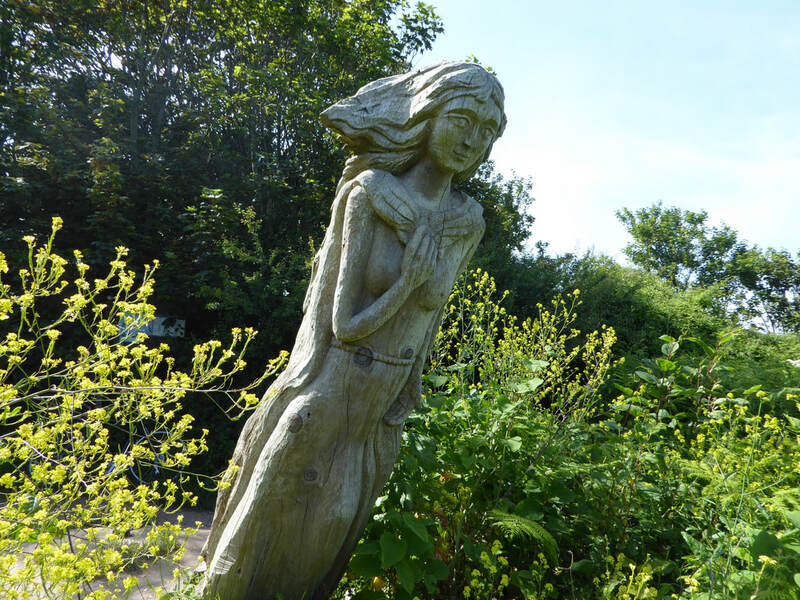 The life sized statue, created by local sculptress Elisabeth Hadley was unveiled in November 2016 and was commissioned to commemorate lives lost at sea and to celebrate Brixham’s fishing heritage. 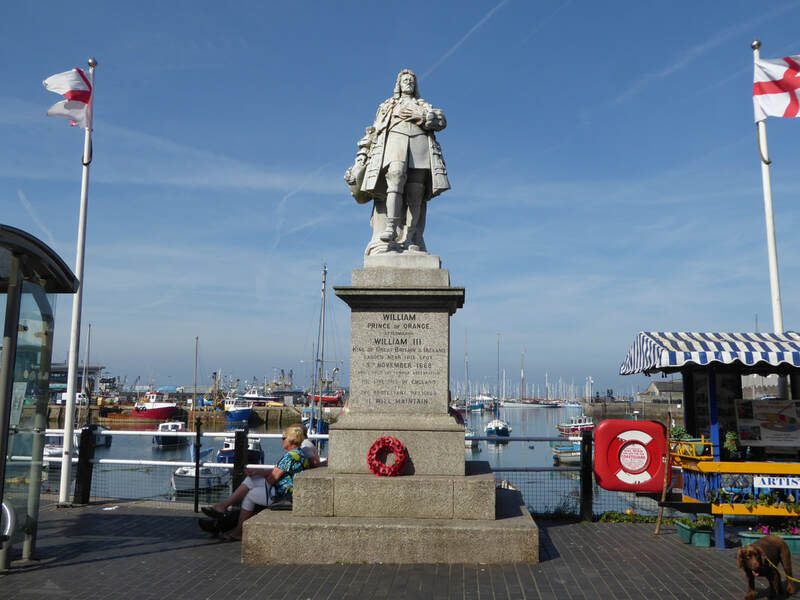 The statue of William (later to become King William III), Prince of Orange who landed here in Brixham with his mainly Dutch Army on 5 November 1688 during the Glorious Revolution to overthrow King James II. The statue was erected in 1889 to celebrate the bicentenary. The tourist attraction replica of the Golden Hind - the ship used by Sir Francis Drake to circumnavigate the globe between 1577 & 1580. 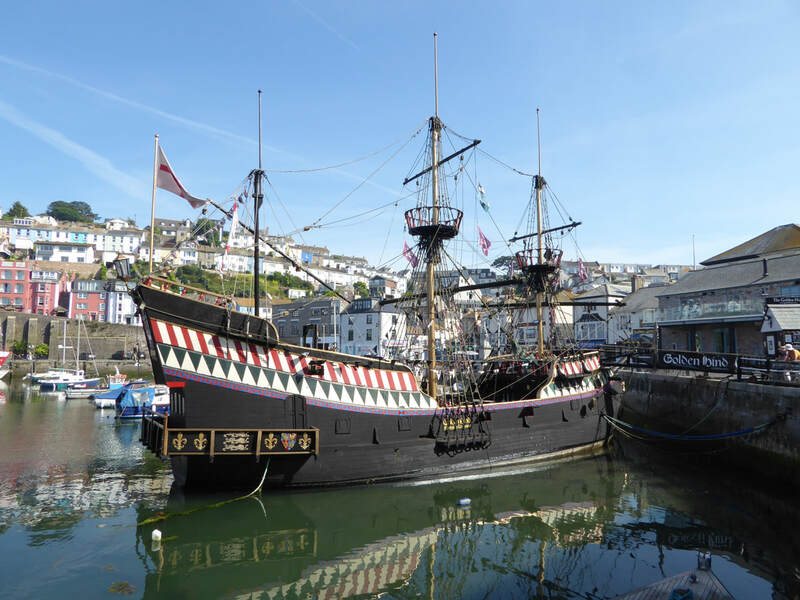 There has been a replica of the ship permanently moored in Brixham Harbour since 1963 following its use in a tv series. The replica ship used in the TV series cost £25,000 to construct and had no rear gallery or gun deck and was a converted fishing boat. 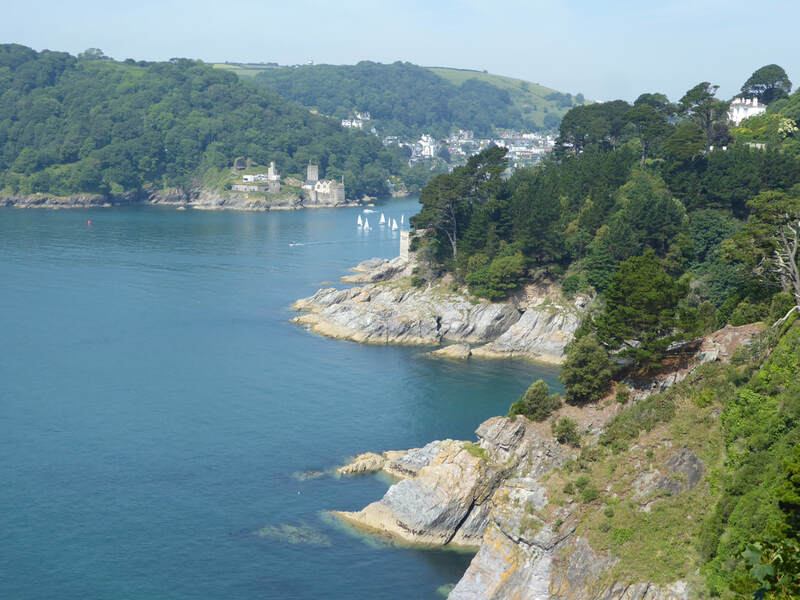 The ship sank whilst under tow in 1987 to Dartmouth for restoration in heavy seas and could not be saved. 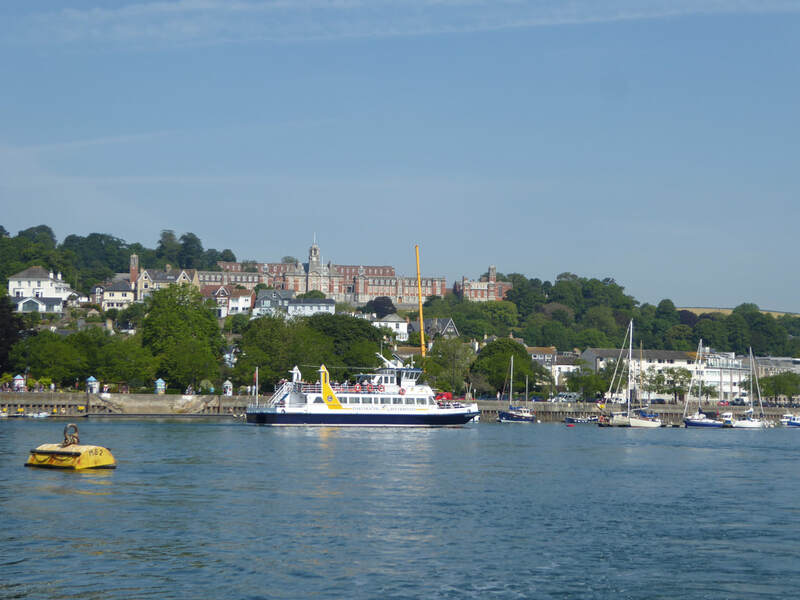 The photo shows the second replica, which is not full size and was completed in 1988 and stands in the harbour welcoming thousands of visitors annually. A nice welcome for Fudge at King's Lodge. 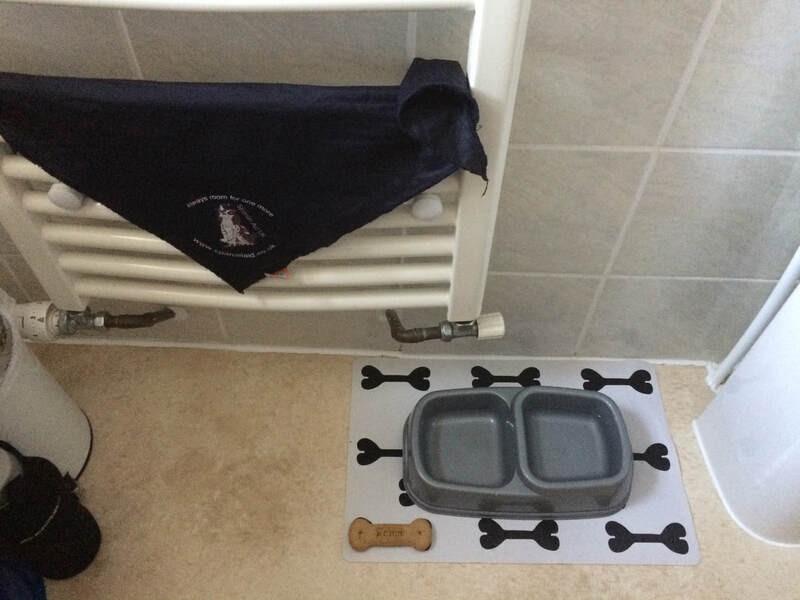 As you can see, he has hung out his Bandana on the radiator to dry - clever pooch.